I took inspiration from this weeks MoJo Monday Sketch and some fab papers from BoBunny. My sentiment (Grow Old QQ0806-C) is from Verses, stamped in Black Archival on White card stock, then sponged with Ranger Distress Ink in Walnut Stain. 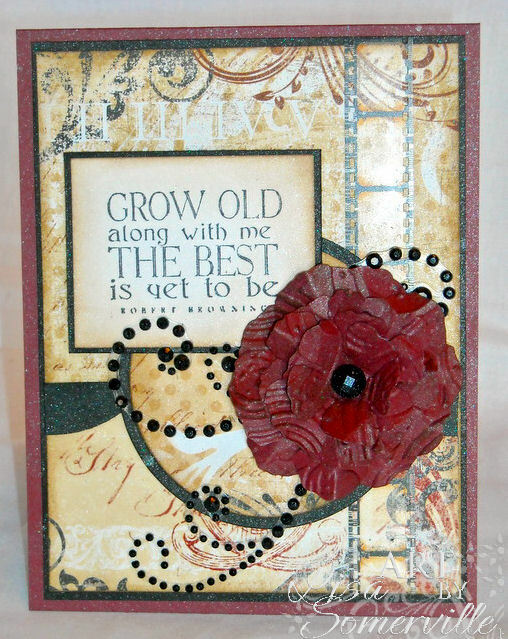 I thought it went well with the vintage papers and flower blossom I created with Spellbinders Rose Creations Die. To embellish, I added some Recollections Pearls and a piece of Filmstrip. Stunning card. Love the sentiment! Beautiful as only you can make it! Love that verse, so true for all of us. Wow what a flower and the paper is beautiful!!!! Great job!!!! ohhh.. this is a gorgous card, Lisa! So elegant and classy! Very pretty! Thanks for joining the challenge at Simon Says Stamp & Show. Beautiful! Love the bling and the sentiment. Gorgeous card. The flower as the circle was very clever and beautiful!